Julius Erving is one of the biggest stars in the history of pro basketball and his cards and memorabilia are high on the collecting radar. Although he started his career with the ABA, Dr. J eventually made his way to the NBA and helped revolutionize the game along the way. With a career that spanned nearly two decades, collectors have plenty of Julius Erving cards to collect and even more autographed cards from recent years. Shop for Julius Erving Cards on eBay. Despite starting his career with the upstart ABA, Erving and his fellow ABA players were included in the 1970's Topps releases alongside their NBA counterparts. Thankfully, this means that the five total seasons he spent playing for the Virginia Squires and New York Nets were not a collecting void for Dr. J. 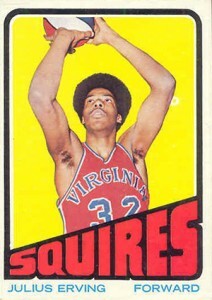 Outside of his rookie card, most of the Julius Erving cards from his playing days can be found for a reasonable amount. Erving was also part of a noteworthy card in 1980-81 Topps, when he appeared on the rookie card for both Larry Bird and Magic Johnson. With his retirement in 1987, Julius Erving cards were not treated to the collecting transformation that occurred a decade later. However, with the increasing amount of autographs found in packs, former greats received a renewed interest. 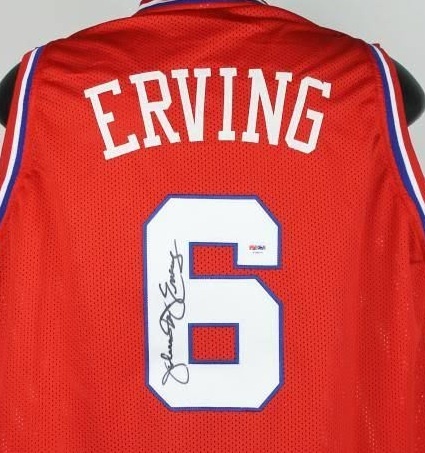 The first Julius Erving autograph was released in 1993, but things really started to pick up in 1999. Collectors can find a large supply of autographed Julius Erving cards from a variety of products, and many remain cheap considering what Erving means to the game. While his autographed cards are more common, signed Julius Erving memorabilia commands a premium, but is still readily available. 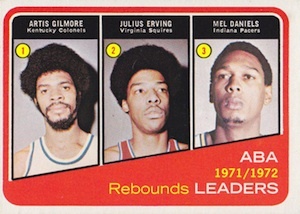 1972-73 Topps brought collectors a colorful and exciting look at the top ABA and NBA players. 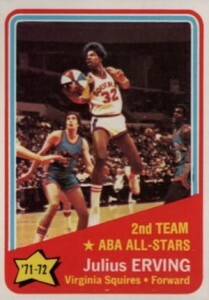 The clear favorite from this set is the first pro card for Julius Erving. As his sole rookie, this card would have enjoyed popularity regardless. However, the card design has aged well and continues to be one of the better basketball base designs of all-time. Ungraded versions can be found for under $50, but be aware that there are reprints. While card #195 gets all the recognition, Julius Erving had two other cards in 1972-73 Topps. Card #255 honors Erving as a 1971-72 2nd Team ABA All-Star and card #263 recognizes him as a league leader in rebounds during 1971-72. Artis Gilmore and Mel Daniels are also featured on the card. 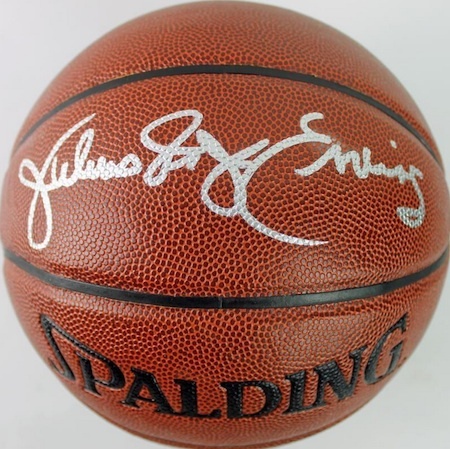 Below you will find an example of what Julius Erving's authentic signature looks like. This can be used as a first point of reference for determining the legitimacy of autograph memorabilia, but is not a substitute for having your items authenticated by a well-respected professional autograph authentication company. Reputable authentication companies include JSA, PSA, Panini Authentic and Mounted Memories, to name a few. The signature is lengthy and distinct, but not entirely legible. Starting with an oversized cursive "J" the first name is the clearest. The middle word is "Dr J" but mashed together so that it resembles an "8" followed by a less clear, cursive "J". A large looping "E" starts the last name and the pen lifts before "r-v-i-n-g" ends the signature.